The Last Chance Nordic Ski Club is Helena’s hometown cross country ski club. Membership is open to cross-country skiers of all abilities, and we encourage all skiers to enjoy the Club’s grooming on the MacDonald Pass and Bill Roberts trails. Named for Helena’s famous gold-bearing Last Chance Gulch, LCNSC began in the 1980s as an informal group of local Nordic skiers, whose duties included overseeing the MacDonald Pass Nordic ski trails. In 1996 we incorporated under the laws of the State of Montana as a public benefit corporation for the purpose of encouraging and supporting cross country skiing in Helena, MT. We groom about fourteen kilometers of trails on MacDonald Pass; these trails unfold just east of the Continental Divide, about fifteen miles west of Helena. When we’re able to do so, we also groom about four kilometers of track on the in-town Bill Roberts Golf Course. We groom Mac Pass and the Golf Course, when snow-depth permits, for both classic and skate skiing. Skiers of all abilities are welcome on either trail, and skiing is free. To defray grooming and other expenses the Club welcomes skiers to become a Last Chance Nordic Ski Club member or make donations. There’s a lot of work done year-around, behind the scenes, to make the MacDonald Pass trails and the Golf Course tracks skiable. Besides grooming four to six days a week, there are snow-machines, rollers, and ginzu’s that need to be purchased and maintained; trails to be kept free of trees, branches, stones, and grass; signs to be erected; maps to be updated; this website to be maintained; restrooms to be maintained and cleaned; grants to be sought and procured; parking lots to be plowed out; and many other large and small but vital tasks. About half the grooming is paid, all other work is done by club members volunteering. Four or so Saturdays a year, our Youth Skiers program provides kids, ages three to twelve, with a couple hours of fun on the snow alongside volunteer instructors and parents while they improve their cross country skiing skills. A weekly Master Skiers program, open to all skiers of all abilities, brings continuing cross country ski education to the eighteen-plus years-old set. To help members communicate about regional races, exchange trail condition reports, share rides, sell XC ski gear, and so forth, LCNSC moderates a Yahoo email list. Club members are automatically signed up when they join or renew their membership. At the bottom of each email list message are directions, giving members instructions for opting out. 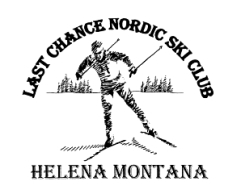 The Last Chance Nordic Ski Club is a Montana non-profit corporation and a federal 501(c)(3) tax-exempt corporation. The Club’s Taxpayer Identification Number is 80-0022948. All the Club’s efforts are funded by membership contributions, grants, and donations. LCNSC has a volunteer board of directors and volunteer program coordinators, and others giving of their time and talents. We’re governed by several documents, including Articles of Incorporation and Bylaws. All club meetings are open, subject to Montana law. The Club has no paid officers or year-around employees, but does pay part-time groomers to groom generally four days a week. Board meetings are open to all. Meeting times, agendas, and minutes are posted on this website. “Sweet-smelling toilet” being swung onto vault. The Helena National Forest provides invaluable support and guidance, as well as a conditional use permit for grooming and maintaining the Mac Pass trails. We work closely with the City of Helena Parks Department so, when there’s sufficient snow in town, we can groom classic and skate ski tracks on Bill Roberts Golf Course. The Club is grateful to Montana Fish, Wildlife & Parks for their support. 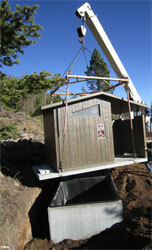 For example, the new “sweet-smelling toilet” planted in 2013, was made possible with the support of both the Helena National Forest and Montana Fish, Wildlife & Parks. We’re grateful for The Base Camp’s long-time cooperation, providing affordable skis, boots, and poles to kids. The Club is appreciative of its many local businesses and private donors for their assistance in purchasing grooming machines and apparatus. Last but not least, we thank our extraordinarily good neighbor, Jeff Battershell, for his unflagging efforts plowing out the Mac Pass parking lot. We welcome your comments and suggestions. We also want to hear from you if you’d like to volunteer or donate to help support cross country skiing near Helena. As we near the end of a great 2018/2019 ski season, please take 5 minutes to complete an online survey that will help guide the future direction of the Last Chance Nordic Ski Club and Nordic skiing opportunities in the Helena area. We kindly ask you to complete the survey by April 30th. Are grants going to disappear? Club is always looking for volunteers! Possibility of 7 days a week of paid grooming? Any possibility of the City doing grooming at the golf course? Instructional discussion-Scott Gerken, Stan, Bruce, etc. Medium ginzu –delivery, payment, etc. Equipment maintenance update—any eqptmnt replacement issues, etc. Website issues and status of stripe account to receive internet based payments, etc. The European Space Agency, almost certainly in close league with the Fédération Internationale de Ski, reports that there is indeed year around skiing on Mars. The 80-plus kilometer-wide crater appears to offer both nordic and alpine skiing opportunities. For area photos, please see this linked NPR article. The take-home for Helena-area skiers is obvious: During low-snow years, or during years of excessive-hyphenation, we have the option of packing up our skis and hitching a ride on one of the increasingly-frequent (if highly irregular) Mars exploratory flights, and make tracks in a remarkably untracked venue. Happy holidays, and see you on the (Korolev) slopes. Received Buy-America approval/waiver for anticipated new Arctic Cat machine!!! Expect a reimbursement request from RAC of about $6000 or $6500 for Q1 2018. In the off-season, Stan and Roy are going to be working with Roy at USFS about some options for minimizing the traffic on Microwave Road.